Jordan made a grand and quick entrance into the world today to the delight of her parents, Jeff & Joy, and her brother, Joshua. Jordan was 7 pounds, 4 ounces and 1'9". She's pretty darn beautiful. I've spent an hour or so reflecting on her short life. What a beautiful thing. I confess that I don't understand a lot about life. I've had several friends recently who've either lost a baby prior to birth or just can't even get pregnant. And here Meghan and I are with a wonderful 19-month old boy and two girls on the way. I can quite surely tell you that I am no more righteous than my friends. I don't understand the distribution of joy via children at this point. But blessed be the name of the Lord. Here's a video I made for Jordan's arrival. Some might find the choice of music interesting for a baby video. I think the words of the song are quite poignant in light of what you're watching. This was incredible Jeremy! I was crying my eyes out!! Congratulations on your new niece. 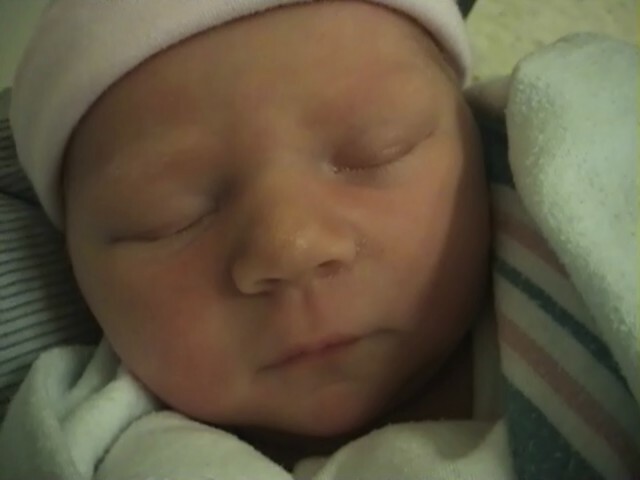 She is absolutely precious!! We love you and give our love to Jeff and Joy too!! Amazing video. Thanks for sharing it with the family! Wonderful, in every sense of that word. Love to Josh, Jordan, Jeff, Joy (jumpin' jehosephat that's a lot of j's) and everyone else from Uncle Floyd who watched it in Little Rock. Incredible, wonderful! She certainly is a beautiful girl! Congratulations to the entire family but particularly to Joy, Jeff and Joshua! Can't wait to meet Jordan in person. That was awesome!! God is truly GREAT!! Thanks Jeremy for a great video...I cried. Joy, Jeff and Josh...I can't wait to see you and give you hugs and to hold that beautiful little girl!!! Love you all..
Wow Jeremy, that was spiritual. Thank you so much for sharing that with us. Truly a beautiful video and display of Christ's miracle. Congratulations from Salisbury, Maryland! We send our love to Jordan, Joshua, Joy, Jeff, and of course, the proud grandparents, Ronnie and Joyce! Congratulations on the beautiful blessing from Indianapolis! You are all in our thoughts and prayers. Great make a grown man cry!! Congrats on your niece. She is so adorable. Because He lives Jordan has entered into the gift of life with a loving family.